Are you suffering from back pain? Do your partner's movements wake you up? Have you fallen off the bed? These (and more) are all signs it's time for a new mattress. Ground yourself with these questions before diving into research about the different types and features for mattresses. From innerspring to air beds, we've outlined all of your choices with pros and cons to help you decide which mattress is right for you. The type of mattress isn't the only decision you'll need to make. Mattresses come with a whole host of other features to take into account. The mattress buying process can be tricky. Fortunately, we've got some insider tips to ensure you don't end up out of luck. As always, check out our list of recommendations for all kinds of sleepers, across the different types of mattresses and different situations. You may not realize this, but buying a mattress is a lot like buying a car or computer. While it can seem expensive at the time, it's an investment in your future comfort—8 to 10 years of comfort, to be exact. You wouldn't buy the cheapest car you can find just to save money now, because that car won't be working years from now. You should treat a mattress the same way. Of course, mattresses aren't as expensive as cars. But that doesn't mean you shouldn't research, test, and take seriously your mattress purchase, just like you would when buying a car. Considering we spend nearly one third of our lives asleep, you'll be spending a lot of time on that mattress. Choosing the right one is important both for your comfort and for your health. Your mattress is more than eight years old. You wake up in pain, still tired, or toss and turn throughout the night. Discomfort while sleeping is also an excellent indication of the need for a new mattress. Getting a bad night's sleep affects everything you do during your day, so investing in a new mattress can drastically improve your energy, focus, and productive sleep. If you wake up with back or neck pain, find yourself exhausted even after sleeping an adequate amount, or find yourself unable to get comfortable while you're trying to get to sleep, it might be time for a new mattress. Your mattress is sagging, creaking, or you feel the coils. More than likely, your mattress breaking down will be the first sign that you need a new one. You may notice yourself rolling to the middle of the bed due to sagging, which is a bad sign for mattresses. You may also find yourself rolling off your bed, indicating that the edge supports are failing. Or your mattress might creak when you move, or the coils might poke you in the back, causing discomfort. All of these are the warning signs of a breaking mattress. You have trouble regulating your body temperature while sleeping. Believe it or not, your mattress plays a big role in regulating your body temperature while you sleep. Some mattresses are made of gel-like materials meant to keep you cool at night, and others are made of materials that tend to absorb body heat, therefore keeping you warmer. If you've ever woken up from being too hot or cold, this could be an indication that you need a different type of mattress. Your sleeping situation has changed in any way. Maybe you've outgrown your mattress and find your feet hanging off the edge—it might be time to get a new one. Maybe you've moved recently and have more (or less) space in your bedroom for a different size or style mattress.. Maybe you now share a bed with a partner—don't assume that the two of you have identical sleeping habits, and consider getting a new mattress that accommodates both of your styles. Any changes to your sleeping environment could be cause for a new mattress. If you found yourself nodding along to any of the points made above, then it's probably a good idea to invest in a new mattress. But before you dive into the types and features associated with mattresses, you should start by asking yourself a few key questions. When selecting what size, you should measure how much space you have in your room first. Then select the mattress that is longer than the tallest person that will be in the bed and wide enough for two people to sit with their arms folded behind their heads without touching. The second most important decision regarding your new mattress will be your budget. Unless you really want to splurge, or have very complex sleeping needs, you should be able to get a great mattress for under $1,000. Lower-end mattresses are usually $700 or less, mid-range is $700-$1,800, and high-end is $1,800+. As a general rule, anything less than $500 may work for non-picky sleepers, but could start reducing the quality of your sleep. Mattress buying is very much a "you get what you pay for" category… to an extent. Once you get past $1,000, it's not always clear what you're getting for that premium price. Many mattress manufacturers recommend "eight days of pay for eight years" when it comes to your budget. This works by taking one day's worth of your pay and multiplying it by eight to get the price you should pay for a mattress that lasts eight years. Also take into account any accessories you might need in addition to your mattress. Do you need a box spring? Mattress topper? Bed frame? While the mattress is probably the most important part of this purchase, you might find bundled deals that save you money on the accessories, and you'll want to consider any additional purchases you might need to make when choosing your budget. When choosing the right mattress type, it's important to understand the way your body is positioned for the majority of the time while you sleep. Different mattresses have different levels of support, pressure, firmness, softness, and more, that are ideal for different body positions. 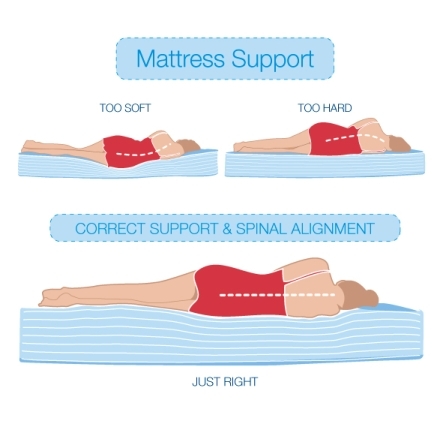 To ensure you're getting the right support (and to prevent back pain), you'll need to pick the right mattress for your body. For example, if you sleep on your side, look for a cushy mattress with pressure relief so that it conforms to your body and keeps your spine aligned in a straight line. If you sleep on your stomach, a cushy mattress can be suffocating. A firmer top will make you more comfortable. If you sleep on your back, you'll need just the right combination of support and "give" to keep your spine in a straight line. If you find yourself switching positions throughout the night, you'll need a mix of features to find a middle ground between firm and soft. What temperature is the room you're sleeping in? Do you run hot or cold at night? Understanding the environment in which you sleep also determines what type of mattress you buy and the materials it's made up of. As mentioned previously, some mattresses are ideal for keeping you cool, while others retain heat and keep you warm at night. In addition, if you find your room gets really hot a night, maybe a cooler mattress will help regulate your temperature and keep you comfortable (and vice versa). As a reference, studies show that setting the temperature to 65 degrees Fahrenheit is best for sleep (about 18C). Consider every part of your environment to ensure that you get the best sleep possible. When adding another person to your sleeping situation, it can get much more complex. If you're fortunate enough that you and your partner sleep in similar positions and temperatures, you may not be concerned with customized features. However, some mattress types are more resistant to movement than others, to ensure both you and your partner sleep comfortably and uninterrupted. There are also adjustable mattresses that can be customized to each person's ideal sleeping situation. Still, these features may come at a premium price. Be sure to consider both of your preferences when choosing a mattress. Now that we've gotten through the questions you should be asking yourself, and you have a good handle on what you're looking for, it's time to dive into the different types of mattresses there are, as well as the pros and cons to each. When you think mattresses, innerspring is probably what you imagine. These are one of the more commonly available mattress types, and are made up of metal coil systems or springs that give that "bouncy" feeling to mattresses. Within the innerspring family, mattresses are differentiated by the number of coils, the type of coil, the thickness or gauge of the coils, number of turns, whether it's doubled up, and more. Most of these terms are irrelevant and unrelated to the quality of the mattress, except when it comes to the type of coils. Hourglass-shaped coils that are most common in mid-range mattresses and generally the least expensive option. A type of hourglass coil where the top and bottom of the coil have been flattened, thus providing more support and better conforming to body shape. Rows of coils made from one single piece of wire in a continuous S-shape that are often more durable. A coil system where each spring is individually wrapped in fabric. Most expensive option, but lasts longer, prevents coils from poking through mattress, and reduces the transfer of motion when moving. Some manufacturers or mattress salespeople will tell you that the number of coils is also important, but this is subjective. At the very least, Furniture.com recommends the following: Full mattresses need at least 300 coils, queen mattresses need 400 coils, and king mattresses require 480 coils. So, as long as the coil count is between 300-480 coils, you should be perfectly fine; any more than that and it would be hard to tell the difference, but any less and you risk back pain from lack of support. Finally, innerspring mattress usually have some type of material on top of the coils for added comfort, such as a pillow top, latex foam, or memory foam. The difference in these materials will also change the price. Memory foam got its start in NASA in the 70s to improve aircraft cushions, but you've likely heard about it most in association with mattresses. Memory foam, or visco elastic foam, is a material that responds to heat and pressure to conform to your body shape, evenly distributing body weight when in use and returning to its original shape when not. It's best known for comfort, due to its transformative properties. However, the biggest complaint of memory foam is that because it retains heat to morph the foam, the material keeps you very warm at night. For hot sleepers, this is not ideal. Latex is another specialty foam option for your mattress, much like memory foam, with a few distinct differences. First, latex is more supportive and durable than memory foam. It is also a more "breathable" material that doesn't warm up from your body heat, yet still provides the same level of comfort by conforming to your body shape. It's main downside in comparison to memory foam is that it tends to transfer motion more, possibly interrupting your partner's sleep. One key feature to note is the type of latex: Natural or Synthetic. Synthetic latex typically contains harmful chemicals, such as formaldehyde or flame retardants, and should be avoided at all costs. It's also important to note that you can find mattresses that use a hybrid of innerspring and foam to get the best of both worlds. If you find yourself torn between the benefits of the two types, a hybrid mattress might be exactly what you need. Air beds use an air-filled core instead of springs or foam, which can be adjusted by releasing or filling the chambers with air. More air = firmer mattress. The mattress can be one big air chamber, or two separate chambers that can be adjusted to individual needs. Usually, air beds are topped with a foam layer for added comfort. Unlike a box spring, adjustable foundations allow you to elevate different parts of the bed for added comfort and health benefits. For example, you can elevate your upper body to prevent sleep apnea or acid reflux, or watch TV/read. You can also elevate your feet. However, if you purchase an adjustable foundation, you'll need a mattress that can be used on it. Memory foam, latex foam, or air beds work best, where as innerspring mattress do not because the coils don't bend well. Most of the benefits of an adjustable bed are similar to that of a multiple chamber air bed. When shopping for a new mattress, you'll notice a lot of buzzwords popping up that describe the different features of the product. Here we outline some of these characteristics, so you can assess which ones are important to you. Perhaps the most important extra feature for you to pay attention to is the warranty—what it covers, for how long, under what circumstances, etc. Length of coverage will be the first indication of how good the warranty is. But a warranty can also be prorated versus non-prorated. A prorated warranty means that you may be responsible for up to 20% of the repair costs, even if it's within the designated time period. Basically, just because it's a 20-year warranty doesn't necessarily mean that manufacturers will cover defects for 20 years. Make sure you read the fine print. When choosing a mattress, you might also consider a mattress topper to add extra support or comfort. A topper can come already attached to the mattress itself, or you can buy an external topper to put on your mattress. Note that a mattress topper is different than a mattress pad, which is typically used to protect the mattress and add a small measure of padding, but not enough to adjust your comfort or support level. Toppers are usually 4-8 inches of extra padding on top of the mattress, and can come in a variety of materials, such as memory foam, latex foam, feather/down, wool, etc. An example of this is an innerspring mattress with a foam topper—the springs provide support and the topper provides comfort. It's a nice compromise for someone who might need a "best of both worlds." Generally, our body temperature lowers while we fall asleep, so cooler temperatures help you fall asleep faster and sleep more comfortably. As we've already mentioned, certain materials in mattresses, sometimes called phase change materials (PCMs), affect your body temperature while you sleep. For example, the foam layer on top of your mattress can come infused with a gel-like substance that allows the material to "breathe" better and keeps your body cool. Without this, some materials (like Memory Foam), retain heat and can cause you to overheat. It's all a matter of comfort and personal preference. With two people sleeping in one bed, it can be frustrating when the other person's movements disturb your sleep. Some mattresses are designed specifically to absorb motion from your partner, so your sleep remains uninterrupted. Also, as we've discussed previously, some mattress types are inherently better at reducing motion transfer than others. Regardless, if you or your partner tosses and turns at night, or one of you is getting in and out of bed while the other sleeps, a motion-reducing mattress can make all the difference. Edge supports are important for two reasons. First, they keep you from rolling off the bed at night. If you tend to move a lot in your sleep, make sure your mattress has firm edge support. And second, they keep you from sliding off the bed when you sit on the edge (to tie your shoes, for example). If you find yourself sitting on the edge of the bed a lot, keep this feature in mind while you shop. Considering the amount of time you'll spend cozying up to your mattress, understanding the materials you're sleeping on is crucial. Unfortunately, mattresses have a bad reputation of being made with materials and chemicals, called volatile organic compounds (VOCs), that can cause health problems over significant periods of time. For example, foam can be made with petroleum oil, which can cause skin irritations, respiratory issues, and a plethora of other serious illnesses. The problem is rooted in the lack of regulation and standardization in how mattresses are made. Manufacturers can use the words "natural" and "green" however they want, rendering these terms virtually meaningless. Truly organic mattresses have at least 95% certified organic fiber. Check the tag and fine print to see just how "natural" your mattress is before purchasing. If you're looking for a guaranteed seal of approval, choose mattresses with a Global Organic Textiles Standard label, Global Organic Latex Standard label, or the Oeko-Tex Standard 100. These seals prohibit harmful chemicals and materials during manufacturing, and require that the product be tested for VOCs, among other things. You will, however, pay a significant premium for mattresses with these labels. Now that you know everything you need to know about mattresses, we'd like to share a few insider tips for your actual mattress purchase—because verifying this information and following these steps will ensure your mattress is properly delivered, unpackaged, and that your warranty remains in tact. Check the Return Policy. The best way to determine whether or not a mattress is right for you is to just try it. You won't know if it's uncomfortable or the right combination of features unless you sleep on it for an extended period of time. But what happens if you don't like it? You'll need to return it, of course. But not every mattress company has a great return policy. Ask a few questions before you make a purchase. Do they offer a full refund or store credit towards another mattress? How long is the return period? Is there a restocking fee? Some retailers may also offer free return pickup. If not, you'll be responsible for shipping the mattress back and likely on the hook for any damage to the product. Buying during the prime times and seasons. There is an ideal time to buy a mattress. You'll find that mattresses are often hugely discounted around holidays or at the end of the season (Spring, Fall). For example, if you're in the US, think Christmas, Black Friday, Memorial Day, 4th of July, Labor Day, etc. If you can afford to wait for the ideal time period, you'll save a ton on your purchase. Order online. Contrary to popular belief, you CAN order mattresses online. The process is generally easier than you would think. Online retailers often have great return policies and test periods, since you do not have the advantage of trying out the mattress in the store. Plus, department stores seriously inflate their prices to create the perception that "sales" are huge deals, when in reality the sale price is actually the retail price. By buying online, you can avoid having to haggle prices, and get great products at better prices. Assess the delivery process and open your item correctly. Like return policies, you should always assess the delivery process before buying. Is delivery included in the cost? How long will it take? What about setup? Some companies drop the mattress at your door, leaving the responsibility of getting it to your room and onto your frame on you. Others will set up the mattress for you, alleviating the stress of that process. Some companies will also dispose of your old mattress and recycle it. Verify what exactly is included from the retailer. Once you receive your new mattress to your doorstep, the first thing you should do is inspect it. Look for an "All-New Material" sticker. If you don't see one, refuse the item. To ensure your warranty remains intact, keep that sticker on the mattress even after you bring it into your home. After unboxing and unwrapping the mattress, be sure to air it out for 24-48 hours before sleeping on it to eliminate any chemical smells. Knowing what to look for is only part of buying a mattress. You also have to sift through all the different brands and types! Fortunately, we've compiled a list of recommendations for any preference and any type of sleeper. You like firm mattress? Have back pain or sleep apnea? Have a partner with different sleeping habits? We've got you covered. If this is your first time embarking on the online mattress buying journey, we hope you found this guide useful! You should have everything you need to buy the right mattress for you (and your partner, if necessary) that helps you get the best sleep possible. Good luck!